I had an insane weekend! I managed to squeeze in making my Dad some cupcakes for his birthday amid all the other cooking I did. We had a family sleep over that ended up lasting from Friday to Sunday. 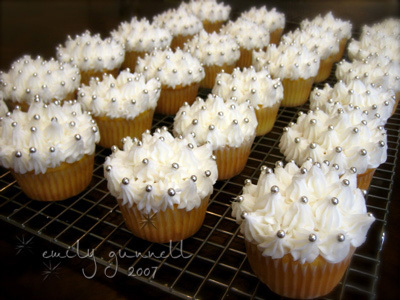 These are lemon cupcakes with buttercream frosting. I used a size 32 tip for the spikes and put one silver ball on each spike. Those are beautiful! And a lot of work, I’m sure! Wow! that’s dedication – putting on those little silver guys on there. ALSO: are those little balls edible? They sure are pretty! Ohhhh sooooo yummy. They look great. These are gorgeous! I bet they taste good too! Yummy! They look sooo amazing & striking! You know my opinion on cupcakes… ick. But these are seriously beautiful! I believe that your cupcakes are the ONLY ones I would ever try. They always look decadent and so yummy!! !